Unlimited access to Universal Studios Florida™, Universal's Islands of Adventure™, Universal’s Volcano Bay™ for up to 14 consecutive days. Access to select live entertainment venues of Universal CityWalk™. It’s the one place where unforgettable family entertainment meets restaurants that don’t just make you say “Yum,” but “Wow”. Universal CityWalk™, The Epicentre of Awesome. 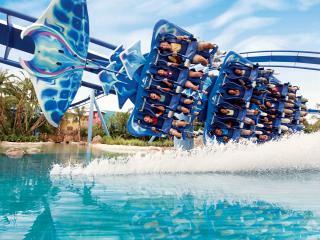 The Orlando Freedom Ticket™ is a combined package of the Disney 14 Day Ultimate Ticket, the Universal 3 Park Explorer Ticket and a 3-Park SeaWorld, Aquatica & Busch Gardens Ticket. You will be sent three separate tickets and each ticket expires 14 days from the first time it is used. The Orlando Freedom Ticket™ is only valid to use in the calendar year purchased. e.g. all tickets included within the 2019 Orlando Freedom Ticket™ must be activated on or before 31 December 2019.